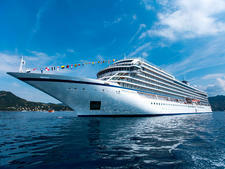 How many cruise companies can build an entirely new line and style of ship, simply because loyal customers ask for it? That's the advantage Viking Ocean Cruises -- the sister line to the already established Viking River Cruises -- enjoyed when it developed Viking Star, its first oceangoing vessel, in 2015. 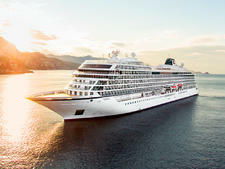 The result is a 930-passenger ship that carries some of the spirit of river cruising onto the high seas. 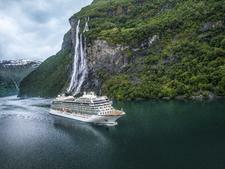 As is the case with the line's river cruises, Viking Star is destination focused with port-intensive itineraries. Calls are longer than average, with frequent overnights. Cruisers receive a choice of included tours in every port; for-fee options are also available. Port talks are in-depth, focusing on sights and history as opposed to shopping opportunities. Other inclusions lifted from river ships include complimentary wine and beer at lunch and dinner, transfers, and most specialty restaurants. Wi-Fi is free and unlimited, and it worked well in cabins and public areas. 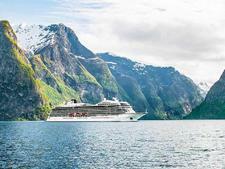 Perhaps the most stunning inclusion is the Nordic spa, which boasts a thalassotherapy pool, a steam room, a hot tub, a sauna, heated ceramic lounge chairs and a cold plunge pool, as well as the first "snow grotto" at sea. This Nordic bent is felt throughout the ship. Viking owner (and native Norwegian) Torstein Hagen has put his own stamp on the line's ocean ships, with modern Scandinavian decor, luxe fabrics and leather furniture, a small historical display on Viking history and family recipes at Mamsen's, a delightful Norwegian-themed casual cafe. The attention to detail and artwork feel personal, even idiosyncratic, making the ship feel more like an intimate boutique hotel than a cruise ship. Viking Star might not please all travelers, though. Because of the destination-intense itineraries, with few days at sea, the ship lacks some amenities to which cruisers might be accustomed. The ship has no casino and only a handful of organized activities scheduled throughout the day. Entertainment at night is inconsistent, ranging from lackluster to engaging. Viking Oceans is unabashedly not oriented to families with young children. The minimum age to sail is 18, and no activities onboard are arranged for children. Viking Star is designed to appeal to well-traveled, curious and value-oriented travelers in the 50-plus age group (though it will also appeal to those younger). 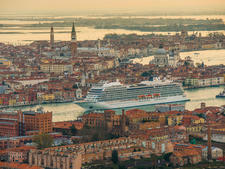 The Viking Ocean Cruises experience is not meant for families, fans of casino gambling (no casino onboard) or those seeking constant onboard entertainment. Cruise Critic’s professional photographers and our extraordinary community members have taken 1,960 pictures of Viking Star. When you visit our photo galleries, you can be assured that what you see is what you get. Resort casual is the prevailing dress code, with a slightly more relaxed feel during the day. The line's literature says that shorts, jeans and comfortable shoes are acceptable for daytime, but swimsuits and workout clothes should be restricted to the pool, gym and spa areas. There are no formal nights on Viking Star, but passengers do tend to dress up a bit in the evenings -- everything from slacks and blouses to dresses for women and khakis with button-downs to suits for men. Daytime dress is allowed at any time in the World Cafe buffet area. Onboard currency is the U.S. dollar. The recommended gratuity is US$15 per person, per day (except for passengers from Australia and New Zealand) and it's automatically added to onboard bills. Passengers can make adjustments by visiting the customer service desk. Alcoholic beverage purchases levy an automatic 15 percent tip. Tips are not automatically added to spa services.